The Capitol is quiet, its halls silent, its chambers shuttered. The Senate is in recess, and in the midst of that quiet, one of its greatest members has passed away. It’s fitting that Sen. Edward M. Kennedy died while his beloved Senate was in recess. There were no committee hearings to chair, no deals to negotiate, no fiery speeches to give. His voice is silenced, but his words and actions will live on. 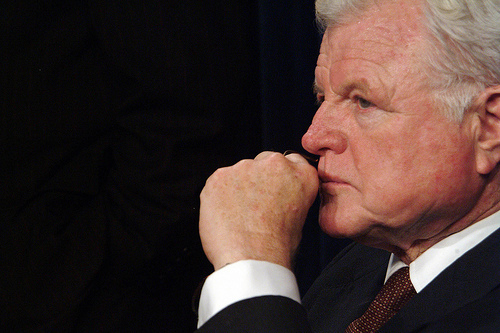 For immigration advocates, Senator Kennedy was a friend, a visionary, and a supreme strategist. He was the architect of the Refuge Act of 1980, a piece of legislation that, since its passage, has fostered a new life for hundreds of thousands of refugees and asylees, sheltering them from persecution in their home countries. He will forever be remembered as the heart of comprehensive immigration reform, fighting back the worst of the changes anti-immigration forces sought to make in 1996, authoring reform bills that would restore due process to the immigration system, and most importantly, forging a plan for comprehensive immigration reform that continues to be the model for today’s legislation. By creating an unlikely partnership with John McCain, Kennedy set the tone for a bipartisan approach to immigration reform, resulting in passage of immigration reform in the Senate in 2006. While that legislation ultimately failed, he came back with renewed vigor in 2007 to start the process again. But things had changed between 2006 and 2007. The Democrats became the majority in the Senate and the House, and Senator Kennedy was re-installed as chair of the Senate Subcommittee on Immigration, Citizenship, Refugees, & Border Security. Frankly, we all thought it would be smooth sailing—after all, if immigration reform passed under a Republican controlled Senate, surely it would move quickly through a Democrat-controlled Senate, especially with a Republican president who had consistently called for comprehensive immigration reform. At least, that’s what everyone was saying when I joined the Subcommittee on a fellowship during 2007. It quickly became apparent that life was going to be far more complicated than we thought. Senator Kennedy, always the supreme negotiator, sat down with Members from both sides of the aisle, Secretary Chertoff, and Secretary Gutierrez to hammer out a deal. That deal, S. 1348, met with lukewarm support from many immigration advocates and was pilloried by those on the far right, who turned the Senate’s efforts to find a way out of our immigration mess into a personal vendetta against immigrants. And yet the Senator persisted, tirelessly working to “bring the twelve million out of the shadows.” This was his mantra and his assessment that our last, best chance to reform immigration could be at this moment. He assured his staff that the things we chafed against could be fixed, that change was incremental, and that we had to believe in the democratic process. We are in this struggle for the long haul. Today’s defeat will not stand. As we continue the battle, we will have ample inspiration in the lives of the immigrants all around us. From Jamestown, to the Pilgrims, to the Irish, to today’s workers, people have come to this country in search of opportunity. They have sought nothing more than a chance to work hard and bring a better life to themselves and their families. They come to our country with their hearts and their minds full of hope. We will endure today’s loss an begin anew to build the kinds of tough, fair, and practical reform worthy of our shared history as immigrants and as Americans. Immigration reforms are always controversial. But Congress was created to muster political will to answer such challenges. Today we didn’t, but tomorrow we will. Senator Kennedy has yielded the floor for the last time. As we commemorate his remarkable life and his commitment to justice, those words from 2007 guide me. They must guide us all as we prepare, yet again, to take on the issue of comprehensive immigration reform. The Senate is at rest. Now, at last, so is the Senator.